For several decades, individuals suffering from a variety of eating disorders in the English- speaking world are likely to have encountered the first edition of Christopher Fairburn’s Overcoming Binge Eating, “published in 1995. 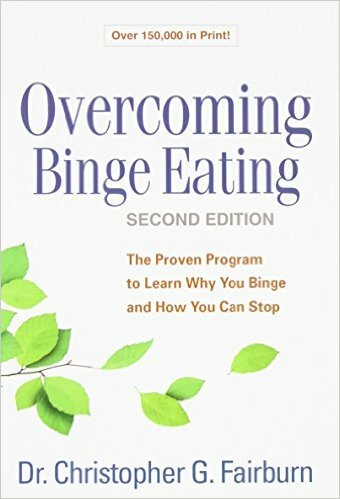 Arguably, with over 100,000 copies in print, this book has been the single most popular book on binge-eating-related disorders and their treatments, and the book to which the largest numbers of patients have been referred for education and self-help. I’ve personally recommended the book to many hundreds of patients, and for good reason. It was clearly written, evidence-based, and practical. Notably, the book and the programs on which it was based, served as central tools in both clinical research and treatment programs. The programs have been so effective that the book gained the distinction of being “prescribe-able” by doctors in the UK National Health Service as if it were a medication. Now Dr. Fairburn, a Professor at Oxford who’s contributed an enormous amount of clinical research, theory, and practical guidance about the treatment of eating disorders, has thoroughly updated the original volume to incorporate additional insights that he and his colleagues have acquired over the past 20 years. This edition particularly emphasizes the “transdiagnostic” perspective that recognizes similarities as well as diagnostic migration among the various “distinct” binge-eating-related disorders. The new edition retains the same crisp, decisive writing style as the first edition. Entirely rewritten educational materials in Part I include a satisfying demographic-bio-psycho-social review of the disorders, examining causes and clinical descriptions. A chapter on the relationship of binge eating to “addictions,” particularly interesting, addresses similarities, differences, and nuances regarding these issues. The overview of treatments considers the accumulated research not only on CBT, but also antidepressant medication, interpersonal psychotherapy and guided self-help. Section II, addressing treatment, includes a self-contained guided self-help manual. Starting with motivational considerations involved in “Getting Ready” (“Why Change?”), this section offers an extended presentation of what has become known as enhanced CBT or “CBT-E.” The tried and true elements of CBT, including keeping a diary, regularizing eating, identifying and incorporating alternative activities to binge eating, with practice and review sessions throughout, are augmented with sections that address dieting practices and body image issues, including over-concerns about shape and weight, shape-checking, shape avoidance, and feeling fat. An additional section speaks to those who are also overweight. In a welcome Appendix, Fairburn recommends additional suggested readings that address frequently encountered co-occurring difficulties such as lack of assertiveness, perfectionism, low self-esteem, and marital conflict. Notes for relatives, friends, and therapists are helpful and to the point. As in the first edition, the tables, illustrations, and special “boxed” pointers are pedagogically useful. The referenced research and additional reading suggestions are entirely up to date. In all, from my perspective this new edition totally succeeds in meeting its intended goals. It updates, teaches and guides. And, just as the first, this volume is also destined to become an instant classic.